AKG Y45BT review | What Hi-Fi? Hands up, anyone who has never accidentally tugged at a wire. We look forward to being free of this tethered tyranny, but it seems it’s necessary if we want to hold on to our sound quality. 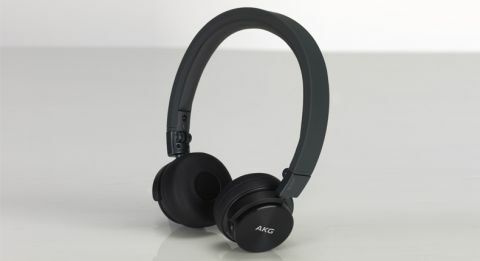 Making a case for the wireless option, though, is AKG and its Y45BT headphones. AKG’s Y-series has already shown promise, with the Y50s being named headphone Product of the Year at our 2014 Awards. Will their wireless siblings do as well? On the outside, the Y45BTs are fairly unassuming. It’s a simple-looking product, which is no bad thing considering the parade of primary colours you see on the street. The understated looks are at odds with the amount of tech packed within. Much of it is packed onto the right ear-cup alone. There’s a smattering of buttons: play/pause, volume up, volume down, and pair/power; near field communication (NFC) speeds up the pairing process too. There’s also a microphone for phone calls, as well as a socket for a cable – you can keep listening even when you’re out of power. Charging takes place on the left ear-cup. Here you’ll find a microUSB slot, which lets you charge from any USB source. AKG reckons the battery lasts for eight hours, although, naturally, this will depend on how much you use the headphones. The headline feature, of course, is Bluetooth. It’s a strong, stable connection and we have no complaints about it. Not once did we experience dropouts and the range is good. We wandered approximately 30 metres from our desk without so much as a stutter – so you’ll be fine leaving that smartphone or tablet in your backpack. Furthermore, the Bluetooth is of the aptX variety. Those with compatible sources will benefit from better sound. Speaking of which, the audio performance is very good. We’re most impressed by the bass on offer. There’s a surprising amount of it, considering the small size (and 40mm drivers) of the headphones. The kick-drum and bassline of Muse’s Panic Station packs punch. It’s a weighty sound, but never overblown. There’s decent tonal balance here, and the Y45BTs never lean too hard on any part of the frequency. The midrange is direct, while the treble is crisp without distortion. We’re happy with the level of integration, and there’s plenty of detail. Instruments offer enough texture to be distinguished easily. The soundstage is not massive, but it is organised. It’s not all good news, however. We could do with more subtlety and refinement. The sound is sometimes bright and can make longer listening more taxing than we’d like. Quieter moments reveal a very subtle hiss that’s not uncommon among Bluetooth headphones. In use, the Y45BTs are perfectly pleasant. The buttons are responsive. Pairing is swift. They’re comfortable to wear, thanks to soft faux-leather and memory foam in the headband and earcups. They grip without squeezing – we wouldn’t recommend headbanging but you could get away with enthusiastic nodding. When you’re finished listening, they fold up and swivel flat. A small carrying pouch is supplied but they’ll happily slip into a pocket. Build quality is strong – there’s a lot of plastic but it’s the tough, resilient kind that can take a knock or two. The AKG Y45BTs are not perfect, but they do an impressive job for the money. They’re portable, comfortable and well made, and they sound good too. These are well worth investigating.